I have enjoyed staying at Bankfield House and although i t was a little noisy up till about midnight, I really have no complaints to make about the room or facilities. The breakfast was the usual affair of cooked English or continental and a good choice was available. 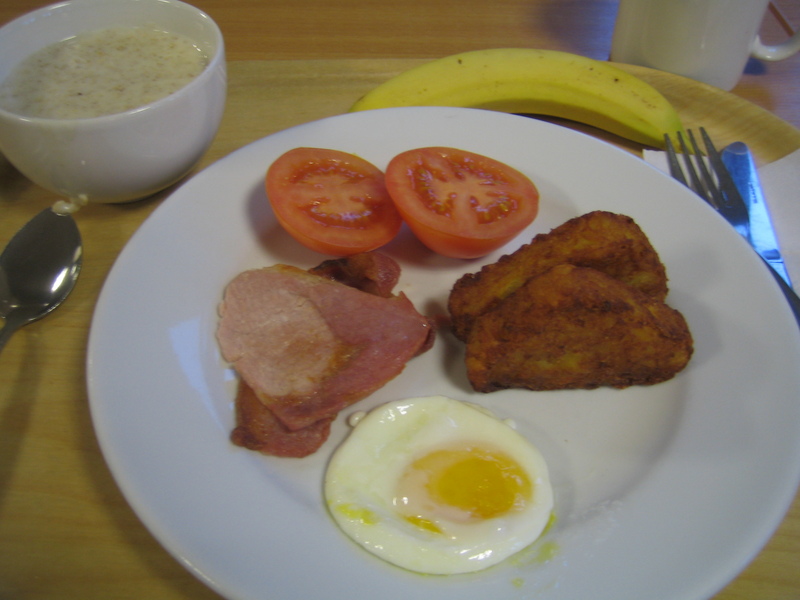 To follow a Low FODMAP theme I chose porridge, a banana, 1 tomato, bacon, egg & hash browns. Again this would not be my normal choice but I did enjoy it – I haven’t realised how much wheat I actually include in my diet until you begin to have to make alternative choices. When on holiday we usually eat a large breakfast and then go on till the evening meal, it is true that to breakfast like a king really sets you up for the day. I was so full that I even saved my banana for later. seen to be really appreciated. This was an excellent exhibition, but I have seen some of the paintings before in Manchester Art Gallery Most where most major artists are represented, including the great Pre-Raphaelites, Dante Gabriel Rossetti, John Everett Millais and William Holman Hunt. We are lucky in Manchester to have these paintings available most of the time but some of them, one is ‘work’ by Ford Madox Brown, will have been loaned to the Tate for their exhibition. If you are in London and feel like visiting, I would recommend it!